Who doesn’t love flags or to use the technical term Vexillology? 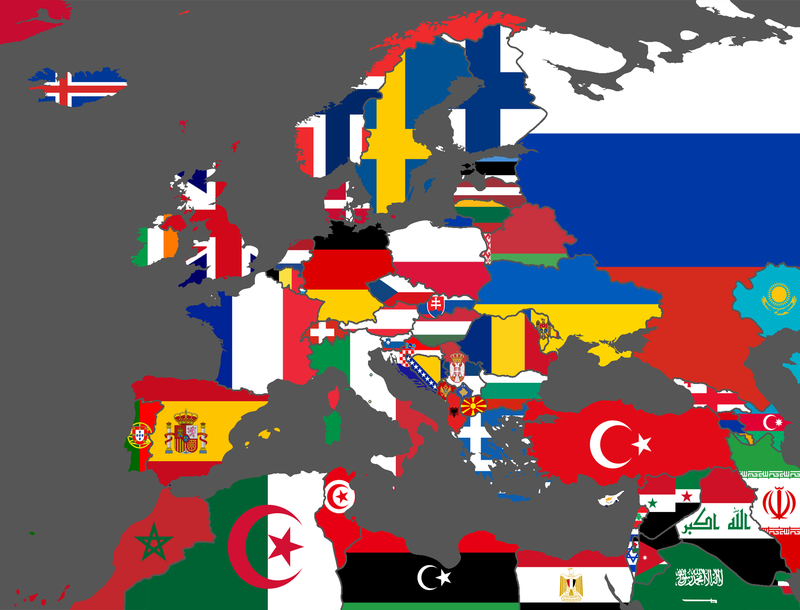 The map above simply matches European, North African and some Middle Eastern countries with their respective flags. Now because people always get upset with these types of maps here a few caveats. The Union Jack is used because it’s the official flag of the United Kingdom. While England, Northern Ireland, Scotland and Wales are constituent countries of the UK, they are not recognized on the International Organization for Standardization (ISO) list of countries. Crimea remains part of Ukraine, for now. The same way you say “Crimea remains part of Ukraine, for now”, you could also say “Crimea remains part of Russia, for now”. Either you define “remain” or you use a non ambiguous word (like belongs de jure). I’m the creator of the map. My heading got removed (even though they credited me?) but I made this in mid-March of 2014, before the Crimea situation flared up. Hope that helps.